In a swift move, Bharatiya Janata Party (BJP) leaders, led by Defence Minister Manohar Parrikar, met Goa Governor Mridula Sinha on Sunday and staked claim to forming a new government in the coastal state.Even as Parrikar knocked on the gates of Raj Bhavan, newly-elected Congress MLAs as well as senior central leaders, including General Secretary Digvijaya Singh, were holed up in a city hotel, deliberating for hours over finalisation of the party's legislative party leader.The BJP contingent of 13 MLAs was led by Parrikar and was accompanied by three legislators each of the Goa Forward party and the Maharashtrawadi Gomantak Party and two Independent legislators, which takes the tally of BJP-aligned legislators to 21. 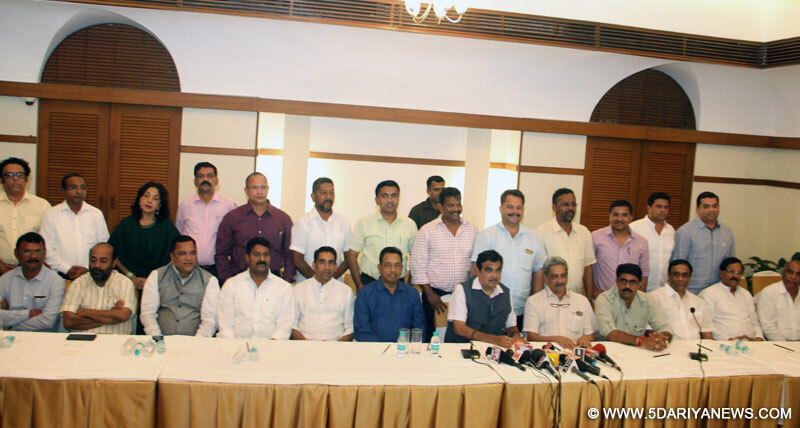 The BJP has also claimed the support of Nationalist Congress Party MLA from Benaulim Churchill Alemao, stating that his letter of support would be also be sent to the Governor soon.The move came after newly-elected BJP legislators passed a resolution demanding that Parrikar return as CM. Parrikar, Gadkari and caretaker Chief Minister Laxmikant Parsekar were also present. Talking to reporters after the meeting with the Governor, Union Transport Minister Nitin Gadkari, who was in-charge of negotiating with non-Congress MLAs for alliance formation, said the BJP would form a stable government in Goa. "We will form a stable government under Manohar Parrikar. Our party President Amit Shah and Prime Minister Narendra Modi have congratulated supporting parties," Gadkari said.The Union minister also said that the discussions with the other MLAs were on since 1 a.m. on Sunday morning and most of the issues and differences had been cleared. "We wanted to clear issues for long term. All should work together," Gadkari said.Parrikar, who is expected to resign as Defence Minister before he is sworn in as Chief Minister, said that although the BJP could not get the required mandate, the target of 21 could be reached with support from non-Congress MLAs. "As far as the mandate of the people (is concerned), we fell short of majority, but with this support, we could reach the figure of 21," said Parrikar, a former Goa Chief Minister, who was elevated to the Defence Ministry in 2014. "We met the Governor and we are expecting invitation from her. Once invitation is received, we will consult colleagues and finalise date for swearing in," he said. Meanwhile, the Congress which was expected to stake claim to forming the government on Sunday evening, has been unable to finalise its legislative leader, with the candidature of state unit President Luizinho Faleiro being resisted by his peers, namely former Chief Minister Pratapsingh Rane and Digambar Kamat.While the Congress, which had fixed an appointment with the Governor for 6 p.m., remained embroiled in finalisation of the CLP leader, the BJP, which was expected to stake claim for government formation on Monday, ended up cobbling together the support of 21 MLAs, before submitting their letters of support to the Governor late on Sunday.The Congress hit out at it. "BJP always claimed to be party of morals and character. Is this the moral or character of a party which is horse-trading... promising corporations, ministries like they are distributing sweets? We strongly condemn any effort of the BJP, particularly Manohar Parrikar, to even think of staking claim to forming government," Digvijaya Singh told reporters.Earlier on Sunday, both BJP and the Congress had held hectic parleys with their counterparts in regional parties and the Independent legislators in a bid to form the new government in the state.